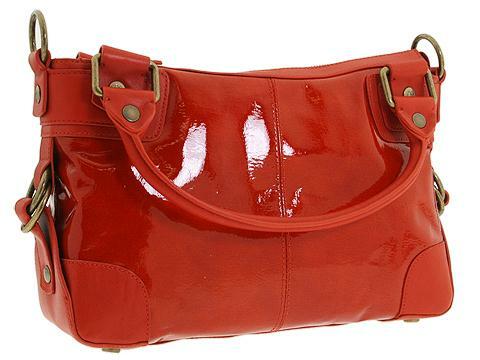 Give your look a jolt with this striking duffel style handbag made of rich patent leather. Holds your wallet, sunglasses, personal technology and a bottle of water. Dimensions: 12 1/2" wide x 4 1/2" deep x 8 1/4" high. 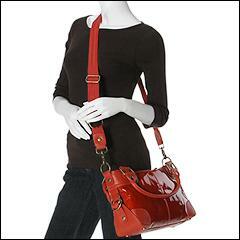 ; Dual handles with an attachable cross body strap. Handle drop: 6 1/4" length. Cross body drop: 26" length. Protective dust bag included. Faux buckle accents. Platform bottom with feet to protect bag when set down. Top zip closure. Interior lining with a back wall zip pocket and multifunctional slip pockets.